The Machine is Compact with Sturdy Sheet metal construction and mounted on four wheels for easy maneuverability. Excellent Arc Striking and Arc Stability throughout the welding current range. Efficient Transductor control for changing welding current. Three-phase full wave bridge circuit for current rectification, Silicon Diodes for high efficiency and longer life. Class H insulation ensures longer life of the coil. Easy Service and maintenance work. Input Current 47 Amps. 70 Amps. 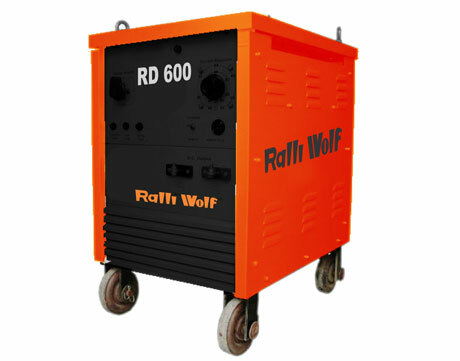 Welding Current Range 60 - 400 Amps. 80 - 600 Amps. Open Circuit Voltage 80 Volts. 80 Volts. Max. Welding Current 400 Amps. 600 Amps. Max. continuous hand Welding current (at 60% duty cycle) 400 Amps. 600 Amps. Remote Control with 10 meters Interconnection Cable. 100 Amps. Switch-Fuse Unit with 80 Amps. Fuse.